This is not a pasta for the faint of palate. We like puttanesca brash, briny, and salty, with way more than a hint of heat. To amplify the flavor we use the oil from the anchovy tin in lieu of regular olive oil and add a little butter and onion to bring out the sweetness of the tomatoes, à la Marcella Hazan. Other than that, the only twists in this recipe are the use of penne, which stands up to chunky sauces better than the more traditional spaghetti, and the addition of a little spinach at the end so you don't feel too guilty about having pasta for dinner yet again. Or, if you really want to make this "pantry exclusive," sub extra olive oil for the butter and cheese, cut the spinach, and live with the guilt. 1. Combine garlic with anchovies, anchovy oil, red pepper flakes, and butter in a large skillet. Sauté over medium heat until chilies are fragrant, anchovies have broken down, and garlic is just starting to turn golden, about 3 minutes. 3. 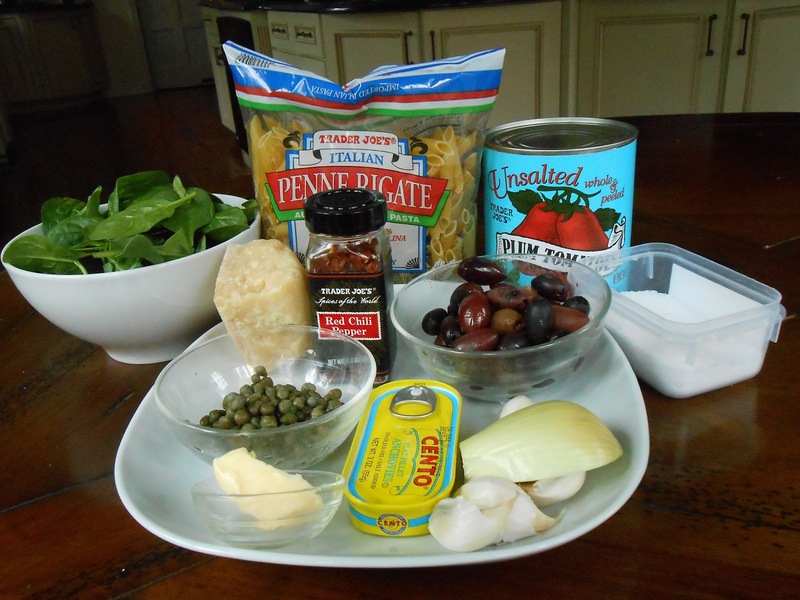 Add olives, capers, and canned tomatoes (swirl a little water around the can to get the last bits off the sides) and break up whole tomatoes with a fork or potato masher. Let the sauce simmer to infuse flavors and cook the tomatoes, about 20 minutes. 4. While sauce is simmering, add salt to 6 quarts of water and bring to a boil over medium-high heat. Add penne and cook 1 minute less than package directions (slightly too chewy). 5. Drain penne, reserving 1/2 cup pasta water. 6. Add penne and pasta water to sauce, stir to combine, and simmer over medium-high heat until pasta has absorbed sauce and is properly al dente (just chewy enough), about 2 minutes. 7. Turn off heat. Stir in spinach and 1/2 cup Parmigiano-Reggiano. Serve immediately, garnished with more cheese. Make sure you have a glass of water on hand.